“Where do you want to eat?” Rob says. “I don’t know. I don’t care. Just pick a place.” I say. “How about XYZ (restaurant).” He says. “No. I don’t want to eat there.” I say. He continues to offer up suggestions as I shoot each and every one of them down. He suggests about five places knowing I’ll say no to all of them. I am an awful person to have to go out to eat with because unless I really want to eat a particular dish, I become indecisive and difficult. However, I always have a back up plan. Cooking dinner at home comes easy for me. Now, I realize for many people it doesn’t come as easy and this is why I’m excited to show you how to make one of the most popular Thai dishes people order when eating out at home. 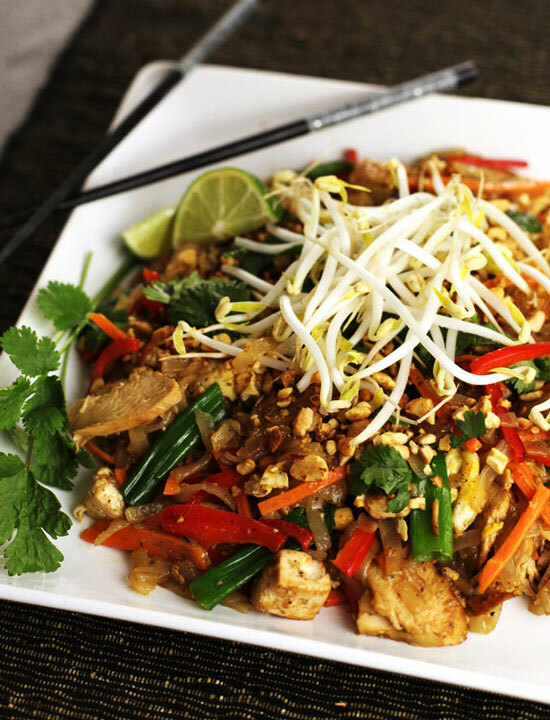 To make good pad Thai is to understand the art of stir-fry. Hot wok (or pan), al dente noodles, no mooshy over cooked vegetables, and having a watchful eye to know when to add more sauce and how much of it will give you amazing pad Thai at home – which makes a great reason not to eat out and engage in the, “where do you want to eat tonight?” battle. Adding sauce to rice noodles a little bit at a time will allow the noodles to fry and not drown, helping it to retain its texture before becoming too soft, like traditional pasta. Each time you add a little sauce to the noodles it absorbs the sauce (think of it like lotion to skin) deepening the flavor every time you add a little more. This recipe is quite easy and all the ingredients can be found online or at your local Asian grocery store. A great tip is to make a large batch of the sauce and keep it on hand in your refrigerator. This way anytime you want to make pad Thai, all you have to do is cook the noodles and blanch any vegetables you want to add. For protein, I usually add tofu and any leftover meat I have in my fridge. Making pad Thai is easy, figuring out where to go eat for dinner is hard. Save yourself an argument and make this one today. Enjoy! PS: This makes a great gluten-free recipe. Just make sure the fish sauce you use does not contain wheat, and most brands don’t. For the full recipe with instructions, please read Alice's weekly PBS Parents recipe column here. Thank you! You don’t know how many ‘Pad Thai’ recipes I come across that omit Tamarind paste. That’s part of what gives it that magical, yummy flavor. Thanks for stopping by. Hope you and your daughter enjoy the cookbook. It’s really a wonderful collection of family recipes from out kitchen. We could from there often and most of the recipes have never been published on the site. If you like the pad thai recipe here, search for the garlic prawns recipe as well as the curry clams. Yes its true this recipe easy and simple. Every country has different cooking style. In Asia, China has totally different cooking style I think chef ability to be good at a range of course, Have extensive experience of specialty diets and food preparation. I’ve tried making pad thai a couple times, but have never been happy with the result. Your recipe looks wonderful, I’m looking forward to trying it. Now I don’t have to dine out to enjoy this very delicious Thai dish. I too am sometimes overcome by indecision when choosing from a variety of restaurants. Much better just give me 1, that way there’s no decision to make. Holy Moly! Can’t wait for Big Daddy to go away so I can make this for MiniMe and Me! Simple elegant presentation.Looks a healthy dish.Will try this..I have got some interesting recipes on my blog too.Do check it out. I love Pad-Thai with lovely peanut flavor! Made this today for my sister because it’s her favorite dish. She said it was the bomb! Thanks!